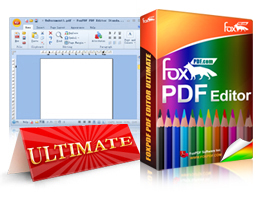 FoxPDF PDF Editor is an All-in-One PDF Creator, PDF Editor, Word Editor. You can edit and convert Microsoft Office Word(Docx, Doc), Rtf, Txt file to Adobe PDF Format or Word Format. Supports Open and Edit Microsoft Offfice Word , Rtf, Txt document formats to Adobe PDF Formats. Support open and edit a variety of file formats to Adobe PDF Format. Supports Open and Edit Microsoft Office Word 2010/2007(DOCX), Word 2003/2000/97(Doc), Rtf, Txt file and You can save file to Adobe PDF Format. You can open in Microsoft Word 2010(Docx), Word 2007(Docx), Word 2003(Doc), Word 2000(Doc) and Word 97(Doc) file format. And through the editing of PDF Editor, you can save as Word file (Docx, Doc). Common File Including Microsoft Office Word(Doc, Docx), Rich Text Format (RTF), Text Format (Txt), Hyper Text Markup Language (Htm, Html), Windows Bitmap (BMP), JPEG Compressed Image (JPG, JPEG, JP2) to Adobe PDF Format. You can set output PDF open password. PDF Editor is a multilingual software, including English, Chinese, German, French, Italian, Japanese. Multi-language support allows you to use more friendly. FoxPDF PDF Editor can edit not only PDF and Word documents, but also able to convert Rtf Files to a PDF file as shown below, this hope for your help.